1. Add the beans, peas and asparagus to a pan of simmering water and cook for 3-4 minutes until just al dente. Drain and reserve the water. Use this water and the stock cube to make up 1.2 litres of stock, and keep it simmering in a pan. 2. Put the onion and celery in a medium non-stick pan. Cook over a medium heat for 3 minutes until soft and golden. Add the rice and stir for 1 minute, then add in the vermouth or dry sherry. Add the stock a ladleful at a time and keep stirring until each one is absorbed. This will take 15-20 minutes. 3. 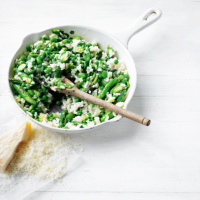 When the rice is almost tender, add the beans, peas and asparagus and cook for a couple of minutes to heat through. Stir in the cheese, butter and parsley off the heat and season to taste.